is chief executive of the Inter-institutional Centre for Language Development and Assessment (ICELDA), a partnership of a number of multi-lingual universities (Stellenbosch, Pretoria, Northwest, Free State). He has published widely in his field. He is the author of Academic literacy: prepare to learn (2007), Beyond expression: a systematic study of the foundations of linguistics (2009, Paideia Press in association with Reformational Publishing project), and A framework for the study of linguistics (2011; co-publication of Van Schaik and Paideia Press). His main current interests are in assessing academic literacy, and in the foundations of applied linguistics. 2011. A Framework for the Study of Linguistics. Grand Rapids: Paideia Press/ Pretoria: Van Schaik. This is an invitation to enter the discipline of linguistics from the perspective of the philosophy of the cosmonomic idea. This introductory work provides an understanding of why and how the discipline is academically sustainable. 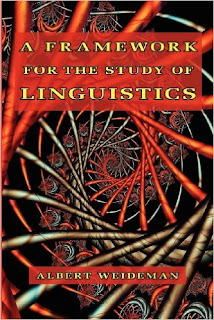 The book defends the idea that linguistics is a single, whole discipline. 2009. 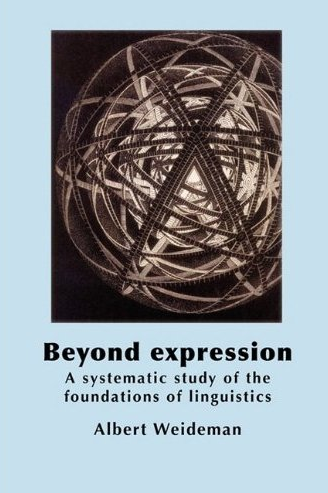 Beyond Expression: A Systematic Study of The Foundations of Linguistics. Beyond Expression is a book for anyone who is interested in the philosophy of the cosmonomic Idea regardless of the discipline they may be in or what their particular interests may be. Besides the fact that the work is an outstanding study of the foundations of linguistics, it has the significantly added benefit of being a beautifully written and superbly clear example of how to do systematically coherent analysis in the tradition of the Cosmonomic Idea. In other words, if you really want to see 'how it's done,' this is the book for you. 1977. Philosophical elements in Four Quartets. Koers 42 (6): 525-532. 1977. Three journeys: one tradition. Standpunte 130 [Vol. 30 (4): 55-62]. 1979. Some basic semiotic categories. Anakainosis 1 (4): 2-7. 1979. Theses on P.A. Verburg's linguistic theory. Anakainosis 2 (1): 8-9. 1985. The role of the psychology of language in applied linguistics. Acta academica Series B 20 (101-107). 1991. Faith and objectivity in linguistic science. Language matters (UK) 1: 10-11.
. 2016 Updated: Five generations of applied linguistics: some framework issues. Acta academica 31 (1): 77-98. 2003. Assessing and developing academic literacy. Per linguam 19 (1 & 2): 55-65. 2003. Towards accountability: a point of orientation for post-modern applied linguistics in the third millennium. Literator. 24(1): 1-20. 2006. A systematically significant episode in applied linguistics. In L.O.K Lategan & J.H. Smit (guest editors) (2006) Time and context relevant philosophy. Special edition 1 of the Journal for Christian scholarship 42 (November; pp. 231-244). 2006. Assessing academic literacy in a task-based approach. Language matters 37(1): 81-101. 2006. Transparency and accountability in applied linguistics. Southern African linguistics and applied language studies 24(1): 71-86. 2007. A responsible agenda for applied linguistics: confessions of a philosopher.LSSA/SAALA/SAALT keynote address July. Per linguam 23(2): 29-53. 2007. Overlapping and divergent agendas: Writing and applied linguistics research. In C. van der Walt (ed.) Living through languages: An African tribute to Rene Dirven . Stellenbosch: African Sun Media. Pp. 147-163. ISBN: 1-919980-31-8. 2007. The redefinition of applied linguistics: modernist and postmodernist views. Southern African linguistics and applied language studies 25(4):589-605. 2008. The idea of lingual economy. Paper read at the ICCLING 2008 conference, Stellenbosch, January. Subsequently published in Koers 72(4): 627-647. [PDF of PowerPoint presentation]. 2009. A framework for the study of linguistics - presentation slides. 2009. Constitutive and regulative conditions for the assessment of academic literacy. SALALS27(3). Original available for free download until June 2012 fromhttp://www.tandfonline.com/doi/abs/10.2989/SALALS.2009.27.3.3.937. 2009. Uncharted territory: A complex systems approach as an emerging paradigm in applied linguistics. Per linguam 25(1): 61-75. Availablehttp://perlinguam.journals.ac.za/pub/article/view/29. 2010. Academic literacy tests: design, development, piloting and refinement. Workshop presented at the Third CELC International Symposium, National University of Singapore. May. (PDF version of PowerPoint slides). 2010. Stability amid change: what our theoretical frameworks accomplish for us. Journal of Christian scholarship. 46(3 & 4): 157-171. 2014. Innovation and reciprocity in applied linguistics. Literator 35(1):1-10. 2014.Positivism and postpositivism in applied linguistics. In C.A. Chapelle (ed.). The encyclopaedia of applied linguistics, Vol. 7, pp. 4479-4485. Oxford: Wiley-Blackwell. 2014. Applied linguistics beyond postmodernism Acta Academica 45(4): 236-255. 2015. Autoethnography and the presentation of belief in scholarly work. Journal for Christian Scholarship 51(3): 125-141. 2015. Uneasy lies the head: poststructuralism in the midst of paradigm contestation in applied linguistics. Koers 80 (4): 1-7. Hoe gemaak met Vergilius en die Latynse letterkunde? Die Skoolblad/The Teacher 60 (7): 16-20; & (9): 3-9. How to tread upon serpents and scorpions (Review). Vanguard (March/April). Gebruiksengels vir professioneles (Review) Die Volksblad 29 May. Laat die wêreld daarbuite binnekom. Die Vrystaatse onderwyser/The Free State teacher 70 (9): 8-13.
a - Review of N.T. van der Merwe (ed.) Interpretasie en oordeel. Koers 46 (3): 293-295.
b - Geregtigheid is nie 'n 'ja, maar ...'-beginsel nie! Roeping en riglyne 29 (2). Voorvrae by konstitusionele hervorming. Woord en daad 22/233: 9-11.
a - Geskiedenis wat anders is: van wolf tot skaapwagter (Review of C. van Onselen's The small matter of a horse). Die Volksblad 20 April. b - What's in a text? Report on a conference on Discourse Analysis in Language Teaching and Translation - Hasselt, Belgium (25-26 October 1985). Linguistics Society of Southern Africa Supplement 4 (2): 10-13. Linguistics Society of Southern Africa Supplement 6 (1): 14-17.
a - 'Warm wind¿ se storietjie yl, maar skrywer het potensiaal. Review of Helloise Norval's Warm wind blowing. Beeld. 29 November: 11.
b - n Kruising tussen Tolkien en Tom Robbins. Review of Kerstin Ekman's Forest of hours. Beeld. 20 December: 9.
a - Vrees dan tog nie ¿ Review of Rentia Mans's English oh so easy! Beeld. 14 February: 9.
b - Harries skryf besondere roman met flinke ontknoping. Review of Ann Harries¿s Manly pursuits. Beeld. 13 March. c - Satire wat niemand en niks in SA ontsien. Review of Peter Wilhelm's The state we're in. Beeld. 20 March: 11.
d - AS Byatt se 'Elementals¿ ses kortverhale met 'n verskil. Review of A.S. Byatt's Elementals. Beeld. 3 April: 7.
e - Is Adam Nicolson ¿n nuwe geslag pastorale filosoof? Review of Adam Nicolson¿s Perch Hill. Beeld. 17 April: 13.
f - ¿The Hours¿ vir opsy sit, herkou. Review of Michael Cunningham¿s The Hours. Beeld. 5 June 2000: 9.
g - Al die bestanddele van Allende-vertelvernuf. Review of Isabel Allende¿s Daughter of fortune. Beeld. 31 July 2000: 13.
h - Iets nuuts vir die Byatt-aangangers. Review of A.S. Byatt¿s The biographer¿s tale. Beeld. 20 November 2000: 13.
a - Pakistan in die jare vyftig deur die oë van ¿n kind. Review of Yvonne Roberts¿s A history of insects. Beeld. 15 January: 9.
b - Review of Martin Amis¿s Experience. Beeld. 15 January: 9.
c - Veeldheid stemme, style in Sontag-roman. Review of Susan Sontag¿s In America. Beeld. 12 March 2001: 13.
d ¿ with R. Adendorff. Tribute to John Keith Chick. In R. Adendorff, L. Kassanga & A.J. Weideman (eds.). Language and accountability: towards a socially sensitive applied linguistics. Special issue of Southern African linguistics and applied language studies 19: vi. - with J.J. Fourie. Industrial communication project, Namibia Chamber of Mines: preliminary report. - with E.P. Beukes. Education in the OFS: a development perspective. Bloemfontein: The Urban Foundation. - with L.A. Alston. Regional education profile: OFS. Bloemfontein: The Urban Foundation. - with L.A. Alston & K. van Loggerenberg. Regional education profile: OFS. Bloemfontein: The Urban Foundation. Regional education profile: OFS. Bloemfontein: The Urban Foundation. a - Making certain: a course for advanced learners of English. Bloemfontein: Patmos. b - with G.J. van Jaarsveld: Doelgerigte Afrikaans; St. 8 & 9: kommunikatiewe oefeninge, aktiwiteite, rolspeletjies en strategieë. Bloemfontein: Patmos. c - with G.J. van Jaarsveld: Doelgerigte Afrikaans 1: handleiding vir onderwysers. Bloemfontein: Patmos. d - with G.J. van Jaarsveld, B. van Rensburg & M.C.J. van Rensburg. Vier kommunikatiewe taaloefeninge. Video. Bloemfontein: BUE, UOFS. a Linguistics: a crash course for students. Bloemfontein: Patmos. b - with G.J. van Jaarsveld. Doelgerigte Afrikaans: vier oefeninge. Video. Bloemfontein: BUE, UOFS. - with R. Olivier, P. Wyndham & M. Pretorius. Saturday morning in town: a neighbourhood-to-neighbourhood experimental ESL class. Video. Bloemfontein: BUE, UOFS. a - (ed.) Styles of teaching and styles of learning: proceedings of the Sixth National SAALA Conference. Bloemfontein: University of the OFS. b - Linguistics: A crash course for students (Revised edition). Bloemfontein: Patmos. a - with A Grobbelaar, B.M. Kitching & R. Belter. Easing into English: a programme for beginners. Video. Bloemfontein: The Urban Foundation. b - Easing into English: a programme for beginners. Bloemfontein: The Urban Foundation. - with M Rousseau. Starting English: a first course for children. Johannesburg: Heinemann-Centaur in association with English Language Methods and Programmes (ELMAP). a - with Matty Strydom and Genoniva Taylor. Starting English. Video. Bloemfontein: ELMAP. b - (ed.) Redefining applied linguistics: proceedings of the 14th Annual Southern African Applied Linguistics Association. Bloemfontein: SAALA. - with Matty Strydom. Afskop in Afrikaans: ¿n eerste kursus vir kinders. Heinemann/Centaur in association with Language Methods and Programmes (L-MAP). (ed.) Socially responsible applied linguistics. Proceedings of the Southern African Applied Linguistics Association 2000 conference. Vols 1 & 2. Bellville: SAALA. (ed.) - with R. Adendorff & L. Kassanga. Language and accountability: towards a socially sensitive applied linguistics. Special issue of Southern African linguistics and applied language studies 19. Designing language teaching: on becoming a reflective professional. Pretoria: BE at UP. ISBN 1-86854-436-2. 109 p.
Academic literacy: prepare to learn. Van Schaik, Pretoria. ISBN 0 627 02541 2. (ed.) - with B. Smeija. Empowerment through language and education: Cases and case studies from North America, Europe, Africa and Japan. Volume 65 of the series Duisburg papers on research in language and culture. Frankfurt am Main: Peter Lang. ISBN 3-631-55088-X. Academic literacy: prepare to learn (Second edition). Van Schaik, Pretoria. ISBN 978 0 627 02690 4. (forthcoming) Beyond expression: A systematic study of the foundations of linguistics. Submitted to The Reformational Publishing Project in association with Paidea Press. Karaktertekening in die Latynse letterkunde - met spesiale verwysing na Aeneas en Dido in die epos van Vergilius. Shimla 1969: 14-16. The Nietzschean superdog. Philosophia reformata 39 (1 & 2) : 66-76.
a - Three journeys: one tradition. Standpunte 130 [Vol. 30 (4): 55-62]. b - Philosophical elements in Four Quartets. Koers 42 (6): 525-532.
a - with D.F.M. Strauss & D.J. van den Berg: Some basic semiotic categories. Anakainosis 1 (4): 2-7.
b - Theses on P.A. Verburg's linguistic theory. Anakainosis 2 (1): 8-9. Oor metode en metodologie. Interim 3, Occasional publication of the INVS (3-10). The systematic bases for the distinction linguistics/applied linguistics. SA journal of linguistics 1 (1): 38-52.
a - General and typical concepts of textual continuity. SA journal of linguistics 2 (1): 69-84.
b - with M.C.J. van Rensburg: 'n Kantaantekening by die grammatika van skryftaal. SA Journal of linguistics 2 (3) : 125-128.
c - From communicative to transactional competence. In K. Chick (ed.) Proceedings of the Third National Southern African Applied Linguistics Association Conference. Durban:University of Natal. Pp. 202-212.
d - On the possibility of synthesizing humanistic and communicative approaches to language teaching. Journal for language teaching 18 (3) : 2-9.
a - The role of the psychology of language in applied linguistics. Acta academica Series B 20 (101-107). b - Discovering conversational units. Acta academica Series B/2: Fokus op die taalkunde (195-207). c - Vier rigtings in kommunikatiewe taalonderrig. Neon 48: 42-51.
d - Teaching the future teachers: from the analysis of classroom talk to the development of materials. L.A.U.D.T. (Linguistic Agency University of Duisburg, formerly Trier) papers Series B142. 19 pp. a - with S.F. Visser: A measure of texture: cohesion in English radio drama dialogue and actual conversation. Pre-published in Textures 2 (1-18); SA journal of linguistics 4 (2) : 87-105.
b - with J. Raath & P.J. van der Walt: Continuity and discontinuity in talk: some brief notes on summonses. SA journal of linguistics 4 (4) : 90-100.
c - Directions in communicative language teaching. L.A.U.D.T. Papers B150. 21 pp. 1987 - G.J. Orr, W.J. Greyling, M. Pretorius & E. van Pletzen: Saturday morning in town: a neighbourhood-to-neighbourhood experimental ESL class for pre-school and school-age children from Mangaung township and a Bloemfontein suburb. Journal for language teaching 21 (3): 83-89.
a - An experimental ESL beginners class. ELTIC reporter13 (1): 4-12.
b - with S.F. Visser: Some suggestions for an improved format for testing concord. Matlhasedi 7 (1 & 2): 28 (September). c - with E.P. Beukes. Education in the OFS: a development perspective. Working paper for a conference on Regional Development in the OFS. Bloemfontein: The Urban Foundation. d - with L. Verster: "Two roads diverged ...": an analysis of the achievement of partings. SA journal of linguistics 6 (4): 55-68. Autocratic, technocratic and revolutionary trends in language teaching. Tertiary education news: focus on higher education (May). Durban: Centre for Tertiary Development, M.L. Sultan Technikon (reprinted in 1990 in Language projects review 5 (1): 4-6.
a - with L.A. Alston: Regional education profile: OFS. Bloemfontein: The Urban Foundation. b - with M. Pretorius: Proposal for a communicative test at beginner level. Practical English teaching (UK) June 1990, 10 (4): 55-56.
c - Struggling into Sesotho: a community language learning (CLL) experience. In K. Chick (ed.) Searching for relevance: contextual issues in applied linguistics in Southern Africa. Durban: SAALA. Pp. 414-420. Faith and objectivity in linguistic science. Language matters (UK) 1: 10-11. Five generations of applied linguistics: some framework questions. In A.J. Weideman (ed.) Redefining applied linguistics: proceedings of the 14th annual SAALA conference. Bloemfontein: SAALA. Five generations of applied linguistics: some framework issues. Acta academica 31 (1): 77-98. The old and the new: reconsidering eclecticism in language teaching. Per linguam 17 (1): 1-13.
a - with Christo van Rensburg. Language proficiency: current strategies, future remedies. SAALT Journal for language teaching 36 (1 & 2): 152-164.
b - with Biki Lepota. Our ways of learning language. SAALT Journal for language teaching 36 (3 & 4): 206-219.
c - Overcoming resistance to innovation: suggestions for encouraging change in language teaching. Per linguam 18(1): 27-40.
a - Towards accountability: a point of orientation for post-modern applied linguistics in the third millennium. Literator. 24(1): 1-20.
b - with Haddish Tesfamariam & Loide Shaalukeni. Resistance to change in language teaching: some African case studies. Southern African linguistics and applied language studies 21 (1 & 2): 67-76.
c - Justifying course and task design in language teaching. Acta academica 35(3): 26-48.
d - Assessing and developing academic literacy. Per linguam 19 (1 & 2): 55-65.
a - with Tobie van Dyk. Switching constructs: on the selection of an appropriate blueprint for academic literacy assessment. SAALT Journal for language teaching 38 (1): 1-13.
b - with Tobie van Dyk. Finding the right measure: from blueprint to specification to item type. SAALT Journal for language teaching 38 (1): 15-24. - with Frans van der Slik. The refinement of a test of academic literacy. Per linguam 21 (1):23-35.
a Transparency and accountability in applied linguistics. Southern African linguistics and applied language studies 24(1): 71-86.
b Assessing academic literacy in a task-based approach. Language matters 37(1): 81-101.
c A systematically significant episode in applied linguistics. In L.O.K Lategan & J.H. Smit (guest editors) (2006) Time and context relevant philosophy. Special edition 1 of the Journal for Christian scholarship 42 (November; pp. 231-244). d. Overlapping and divergent agendas: Writing and applied linguistics research. In C. van der Walt (ed.) Living through languages: An African tribute to Rene Dirven. Stellenbosch: African Sun Media. Pp. 147-163. ISBN: 1-919980-31-8.
a The redefinition of applied linguistics: modernist and postmodernist views. Southern African linguistics and applied language studies 25(4): 589-605.
b with E. Naude & B. Louw. First steps toward developing tools for language assessment in multilingual urban preschoolers. Southern African linguistics and applied language studies 25(4): 519-538.
c Towards a responsible agenda for applied linguistics: Confessions of a philosopher. Per linguam 23(2): 29-53.
d The idea of lingual economy. Koers 72(4): 627-647.
e ¿ with F. van der Slik. Testing academic literacy over time: Is the academic literacy of first year students deteriorating? Ensovoort 11(2): 126-137.
a - with F. van der Slik. The stability of test design: Measuring difference in performance across several administrations of a test of academic literacy. Acta academica 40(1): 161-182.
b - with F. van der Slik. Measures of improvement in academic literacy. Southern African linguistics and applied language studies 26(3): 363-378.
a Constitutive and regulative conditions for the assessment of academic literacy. Paper prepared for a symposium at AILA 2008 (Essen) on ¿Assessing the academic literacy of additional language students¿, 26 August. Forthcoming in a special edition of Southern African linguistics and applied language studies (ed. : J. Geldenhuys). b ¿ with F. van der Slik. Revisiting test stability: further evidence relating to the measurement of difference in performance on a test of academic literacy. Forthcoming in a special edition of Southern African linguistics and applied language studies (ed. : J. Geldenhuys). c. Uncharted territory: An emerging paradigm and the foundations of applied linguistics. Submitted to Per linguam.